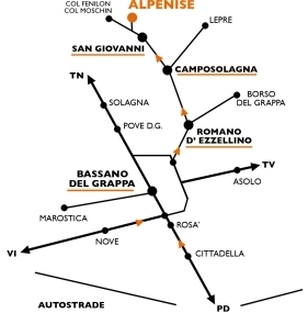 From Bassano del Grappa follow the signs to Romano D’Ezzelino and then follow signs to Cima Grappa. In Camposolagna turn left toward Colli Alti and San Giovanni. Once in San Giovanni, pass the hotel and go on for 1 km and then take the unsurfaced road towards Col Fenilon and Col Moschin. After 200 mt you will find us on the right side of the road.